Another Difference Between Men and Women – Real Life Solutions Counseling, Inc.
We already know there are countless differences between men and women. Some of these differences greatly affect the quality of an intimate relationship. I see so many of these differences in action while working with my couples. One of the ones I see often is apparent in both my dating couples as well as my couples who have been together long periods of time. When a man chooses his mate, he chooses her based on being completely satisfied with her. A man does not have an agenda to make any modifications to her. A man is content with her just how she is. Now, women are typically a different story. It is very common for women to fall in love with the ‘potential’ she sees in her partner. Women often DO have an agenda and DO attempt to make modifications to her partner. Men usually pick up on this pretty quickly and become confused wondering why he was acceptable to her at one point and now she is trying to “change me”. Nagging does NOT work! It never has and it never will! There are much more effective methods in helping your partner to do some “tweaking”. They involve unconditional love and acceptance, as well as appreciation. Women, do you want to learn to love your partner so much that they are willing to do things a little differently? Men, do you want a better understanding of why your partner was satisfied but now she is not? 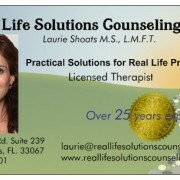 https://reallifesolutionscounseling.com/wp-content/uploads/2016/01/vistaprint-business-card-real-life-solutions.jpg 305 521 Laurie Shoats https://reallifesolutionscounseling.com/wp-content/uploads/2015/04/real-life-solutions-logo-medium.png Laurie Shoats2016-02-16 18:59:502017-02-02 15:18:28Another Difference Between Men and Women - Real Life Solutions Counseling, Inc.
How Much Are You Willing To Invest In Your Relationship? 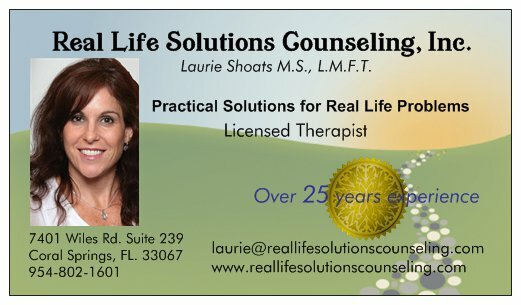 - Real Life Solutions Counseling, Inc.
Two Most Important Things in a Relationship- Real Life Solutions Counseling,... Do You Talk Too Much or Not Enough?- Real Life Solutions Counseling, Inc.